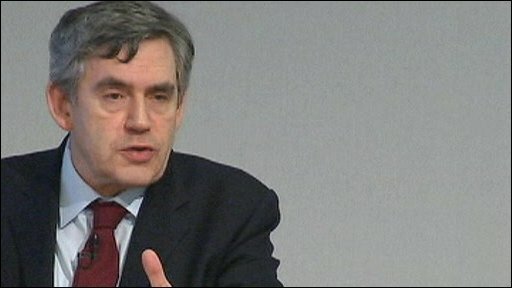 Moving the UK to a low-carbon economy will create 400,000 new jobs over the next eight years, Gordon Brown has told a summit in London. The prime minister called for an international "green new deal" to boost the environmental sector and help lift the global economy out of recession. This will increase "confidence and certainty", he added. But unions and environmental groups called for more funding for green projects, along with better regulation. The government has set a target of reducing greenhouse gas emissions by 80% from 1990 levels by 2050.
Business Secretary Lord Mandelson had green custard thrown over him by a protester as he arrived at the launch of the low-carbon summit. The protester, Leila Deen, told the BBC that she was protesting on behalf on environmental group Plane Stupid. She said her actions were motivated by Lord Mandelson's involvement in the government's decision to approve a new runway at Heathrow. Mr Brown used the meeting to release independent research which, it is claimed, shows a total of 1.3 million people will be employed in the environmental sector by 2017 - representing an annual growth rate of 5%. He said more and more countries were already including "green" measures in their fiscal stimulus packages. Mr Brown said that, during his talks this week with US President Barack Obama in Washington, they agreed on the "imperative" of investing in cleaner technologies to create jobs and growth. "We know that the more we are able to co-ordinate these measures internationally, the more confidence and certainty we will build and the more investment we will be able to bring forward," he said. "That's why I want to create a global 'green new deal' that will pave the way for a low-carbon recovery and to help us build tomorrow's green economy today." For the Conservatives, shadow environment secretary Greg Clark said: "Instead of indulging in yet another talking shop, ministers should be taking action now to implement a green new deal. This is a time to act, not a time to talk." The Renewable Energy Association called for £625m in "green stimulus money". Director-general Philip Wolfe said: "Other countries have already committed huge sums to renewables as part of their stimulus packages, not just because renewables tackle the twin threats of climate change and energy security, but because they also offer the technological stimulus needed in a recession to create high-value jobs and enterprise. "It is vital for the UK to stage a sustainable economic recovery and our investment package is an essential first step towards that." Nathan Argent of Greenpeace said: "If this government wants to create tens of thousands of British jobs and tackle fuel poverty, energy security and climate change in the fastest and most cost-effective way possible then they should invest in renewables and a serious energy efficiency programme. "With the best renewable energy resources and the worst housing stock in Europe, there is no better time to turn the recession crisis into an opportunity." Friends of the Earth's executive director, Andy Atkins, said the environment needed more than words. "Today's summit is an encouraging development, but ministers must grasp the scale of the challenge we face. We need urgent and decisive action, not more token gestures and hot air," he said. TUC deputy general secretary Frances O'Grady said: "Moving to a low-carbon economy provides an opportunity to create jobs across the country from high-tech industry to public services. "But pre-recession tools and techniques will not work. Regulation, government grants and direct government activity may have been unfashionable in the boom years, but they are the only way we can 'green' the economy in the midst of bust."